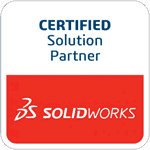 Springville, CA, December 9, 2010 – TEDCF Publishing, a SolidWorks Solution Partner and producer of interactive, multi-media training courses, today announced the availability of SolidWorks 2011: Professional Modeling on CD-ROM. The course has over 5.5 hours of lessons focusing on how to use the commands in order to create structurally sound, editable models. David Melvin, PE, the author of the course, demonstrates these skills and shows how to produce parts with professional quality. Some of these new features include: lessons in Metric & English, adjustable playback speed, and full-screen capabilities. Learn more about the new SolidWorks 2011: Professional Modeling training course on CD-ROM.